« Welcome to the Daybreak Imagery Blog! It’s November already and hard to believe that I still have a few butterflies hanging around what’s left of my flowers. When I give my programs on butterfly gardening, I tell people to make sure something is blooming from the time the first butterflies appear in spring until the first hard freeze so this year I practiced what I preach—and it worked! Today I spotted Cloudless Sulphurs, Common Buckeyes, and a couple dozen skippers skipping about the faded asters along the driveway flower bed and on clover in the lawn. Last week, before our first hard freeze of the season, I watched Cloudless Sulphurs, Common Buckeyes, assorted skippers, Painted Ladies, Checkered Skippers, Silver- Spotted Skippers, and Cabbage Whites nectaring on asters, catmints, lantanas, and salvias. And as I say goodbye to my butterfly friends for this season, I’m already planning what to plant for them next spring. My earliest perennials, such as Creeping Phlox Phlox subulata, Walker’s Low Catmint Nepeta racemosa and Pink Cranesbill Geranium sanguineum, usually bloom just in time for the first hatches of Black Swallowtail and Pipevine Swallowtail butterflies that have overwintered as chrysalises. The nice thing about early perennials is that they’ll bloom on their own before I can plant annuals in my Zone 5 garden. To understand what flowers work best for butterfly gardens, think about how a butterfly feeds. First and foremost, the flower must contain nectar. Since a butterfly inserts its proboscis into the tubes of flowers to gather nectar, it stands to reason that the flowers should have “tubes” that hold this nectar. Most butterflies perch on flowers that have clusters of tubular-shaped nectar-rich flowers to feed—so that’s what kind of flowers you’ll want to plant. To see photos of some of our butterflies in our gardens, go to our Gallery and search for Butterflies. 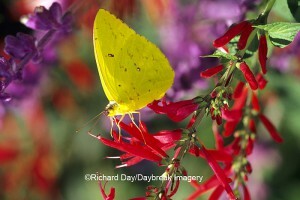 We also have a 2011 Butterflies Calendar available and all photos were taken by Richard Day in our gardens here at the Daybreak Sanctuary. This entry was posted on Tuesday, November 9th, 2010 at 5:04 pm	and is filed under Butterflies, Calendars, Gardens, Seasons. You can follow any responses to this entry through the RSS 2.0 feed. Both comments and pings are currently closed.